‘Learning tags’ are like labels or keywords that you can attach to learning stories. Teachers use Learning tags to relate stories to elements of the curriculum, outcomes, goals, values, culture, interests or subjects. This makes it easier for parents and family members to understand how a child’s behaviour within a story relates to learning outcomes or the curriculum. But tags don’t have to be tied to learning methodologies. You can add existing tags to stories or create your own. Family members can use learning tags to label things like ‘milestones’, ‘celebration’, ‘trip’, ‘laughing’, ‘dancing’, ‘first day’, ‘animals’, ‘visitor’, ‘success’, ‘video’, ‘party’… and anything else you can think of that relates to your stories. 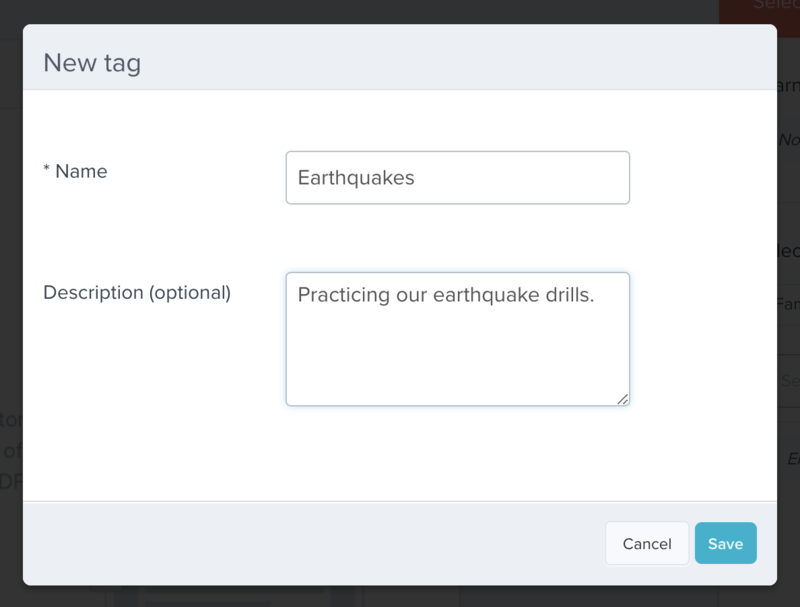 Each tag consists of a tag name and an optional description. The tags you attach appear to the right of each published story. The optional description is visible when a user clicks on a tag attached to the story. 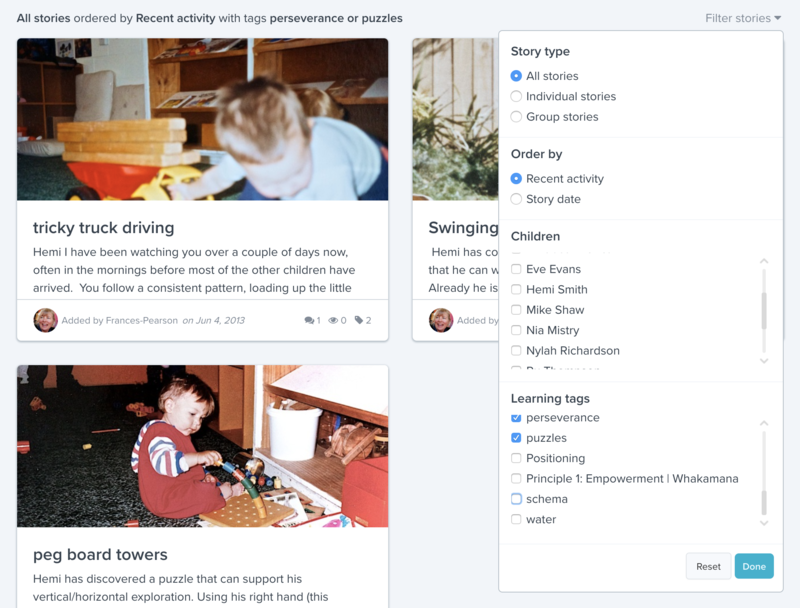 Adding learning tags to your stories lets you group stories since you can filter or search for the learning tag and view all the stories that contain it. You might, for example, filter stories by the tag ‘Milestones’ and see all the stories where the child has achieved a milestone, or significant ‘first’. They will be displayed in chronological order enabling you to track learning and development over time. You can create and add tags directly within the story editor. To the right of the story editor and beneath the child selector there is a panel with two sections. The top section, 'Learning tags' displays all learning tags that will be added to the story. The bottom section displays all learning tags that your early learning service has set up within your ‘Learning Sets’ page. Click the arrow in the top box and a drop-down menu will appear showing all the learning tags that have been used in your stories, sorted by the people that have added them. You can choose to use learning tags from any learning sets you have access to. By default you're shown all learning tags but if you click the drop-down menu you'll be able to choose which set of tags you wish to display. If you want to add a new tag you haven’t used before, click the ‘New tag’ link at the top of the panel. A drop-down box will appear where you can type the tag name and an optional description which people can read if they click on the tag in the published story. To remove the tag again, simply click the ‘x’ to the right of each tag. Go to a child’s profile page. Above your child’s stories, on the right of the page, click on the ‘Filter by:’ button. In the drop-down box, (if you have stories with tags in them) click on any tag in the list and you’ll be shown only the stories with that learning tag in them.